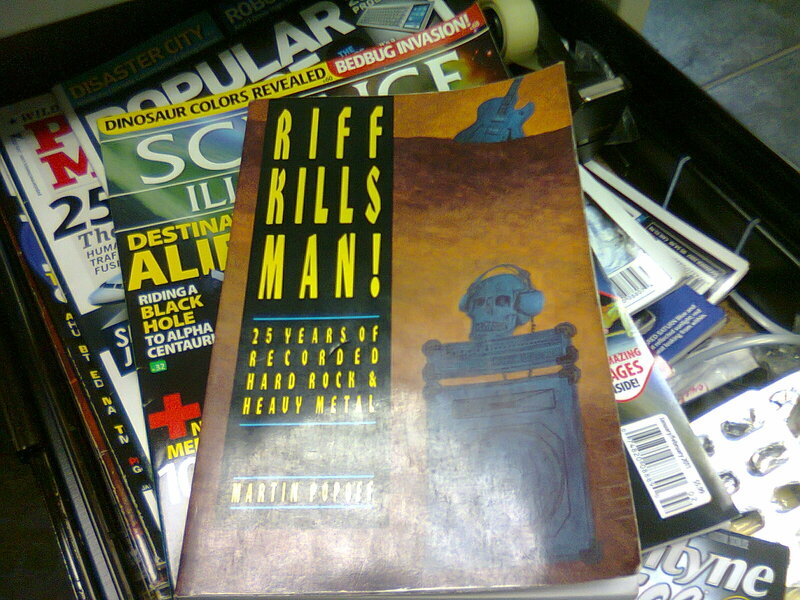 Part 21: “The Book” / REVIEW: Martin Popoff – Riff Kills Man! Trevor was right! Ipso Facto by Rik Emmett was rated a 0/10, with a single sentence review: “Man, don’t get me started.” The book was hilarious and informative at the same time. We all found it entertaining as well as useful. When the book came around to me, I was really curious about this band called Budgie. New fave band! Eventually, I returned the book to Tom who passed it on to someone else, probably Uncle Meat. Certain things always stuck in my head. According to Popoff, I clearly needed more Thin Lizzy, so I began rectifying that with a box set. He didn’t think much of Kiss, but I could understand this given his criteria, even if I disagreed. I wished I owned a copy, and a year later I found one downtown at Encore Records, second hand. Then a weird coincidence happened. Just as I was craving another read, and was preparing to go downtown and buy a copy of Riff Kills Man, a regular customer of mine gave me his copy. I don’t remember too much about this guy, except that he sold more than he bought. He sold a lot of hard-to-find goth and punk stuff, and he always wore a jean jacket, and he strangely always smelled like fried eggs. Since I can’t remember his name, I’ll call him Fried Eggs Man. So Fried Eggs Man had been talking to me about the book, and passed it onto me free of charge. I thought that was really cool of him. The book too smells of fried eggs, and was coming apart. I used Bounce dryer sheets to help out with the smell, and I painstakingly glued the pages back in with Elmer’s white glue. I had to do some cover repair work as well, but the book is solid as a rock and has served me well for probably a decade and a half by now. Martin Popoff, a writer for BW&BK magazine, is simply one of the most knowledgeable metal fans out there. His record collection sounds like it’s to die for. Riff Kills Man! is his first book, but today, he has an extensive bibliography of books that I consider among the best sources of rock information out there. In fact, LeBrain himself relies heavily on Popoff’s teachings, and I will admit to consciously emulating him in my earlier reviews. Riff Kills Man!, later supplanted by his more up to date and complete Collector’s Guides, is an album-by-album review of virtually every major metal record from its inception to 1992, all stuff which belonged to Popoff’s personal collection. He covers subgenres such as punk metal and grunge, and bands so obscure that you may never be able to find their albums. Rated from 1 to 10, with strict rules for rating, Riff Kills Man! gives you a great place to start when looking for something “new” to listen to. If it wasn’t for all the 9 and 10 star reviews in this book, I may never have started listening to Budgie, or Thin Lizzy, or Diamond Head. His rating system is fairly complex, but for the most part, as objective as possible. I don’t necessarily agree with all of the author’s opinions. For example, Popoff really dislikes a lot of pop rock and gives both Adrenalize and Hysteria by Def Leppard a big fat 0. “An offensive kick in the head from the rock n’ roll bored room,” writes Popoff. You may agree, but for me Hysteria is a classic record. Regardless, he makes valid points that even the most staunch fan such as myself have to grudgingly agree with. Popoff also tends to dislike live albums with meandering jams like many old Deep Purple recordings. He generally focuses on studio albums, avoiding most EPs and complitions. So if you’re looking for complete reviews of, say, the numerous Thin Lizzy EPs, live releases and compilations, look elsewhere. Martin ends the book with several lists and indexes: Top desert island albums, top guitar players, vocalists, producers, you name it. He also has a lot of unique categories all his own, such as best showman, best comeback, most consistent band, etc. AC/DC are ranked as his #1 band in the category of worst album covers! That aside, Riff Kills Man! was, for me, an essential and often hilarious piece of reading. Pick it up, and then move forward for some of Popoff’s more complete and more specialized books. I keep mine in my desk at work at all times! DISCLAIMER – Although it can be found used, this book is out of print. I spoke to Martin Popoff once about this book, and he told me he finds it a bit embarrassing today. I still think it’s awesome. Also recommended by Popoff: His books on Sabbath, Rush, Rainbow, and Priest are definitive. The best books on the market for those bands.